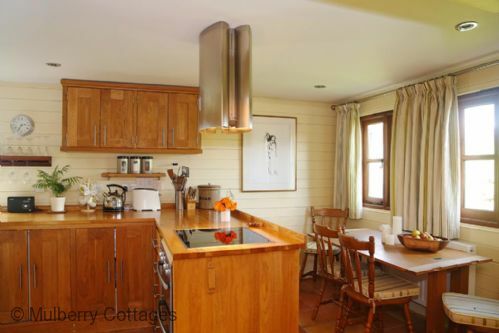 Located down a quiet cul de sac and surrounded by open countryside, this charming barn really is in an idyllic setting. 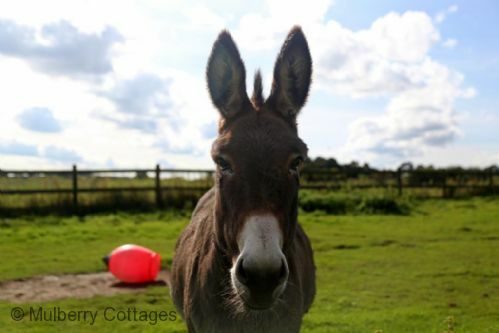 In the grounds of the owner's lovely house and yet very private, the barn is surrounded by a cottage garden with a nearby paddock, home to two gorgeous donkeys and a couple of very friendly rescue goats. A large patio with garden furniture is perfect for alfresco dining and relaxing on sunny, summer evenings. 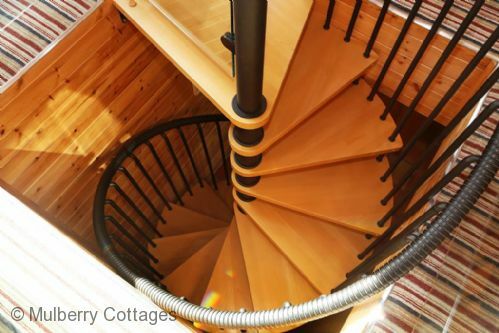 Inside, the barn has everything you wish for a cosy and comfortable stay. 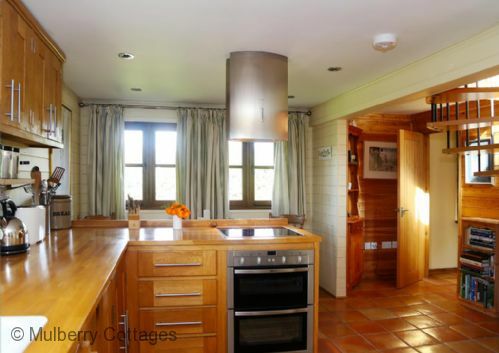 A modern kitchen and dining area, a sitting room with TV, and a shower room. 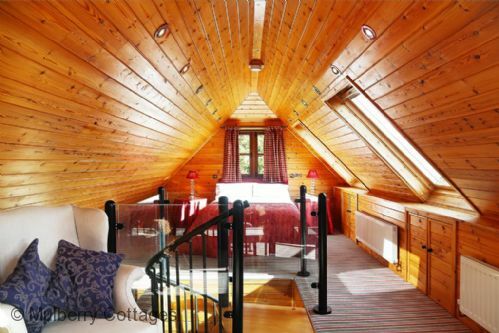 Upstairs is an amazing vaulted ceiling master bedroom with kingsize bed and a lovely reading gallery with armchairs and table and stunning views over the countryside. 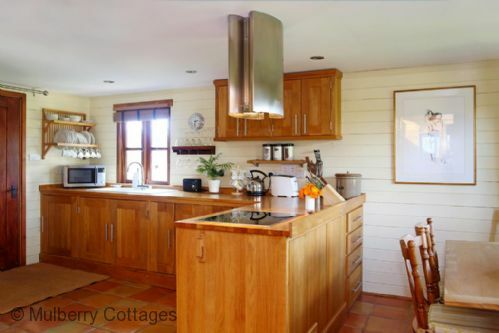 Redfern Barn is perfect for summer holidays or short breaks whatever the time of year. The picturesque village of Wye is within walking distance with a variety of pubs, restaurants and local shops. 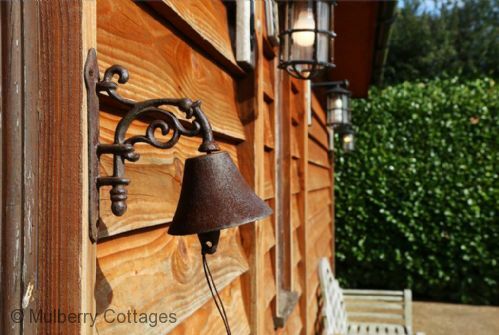 The barn is located on the North Downs Way and surrounded by miles of country walks on your doorstep. The City of Canterbury is a short drive away, as is the Ashford International station with easy links to Lindon and Europe. 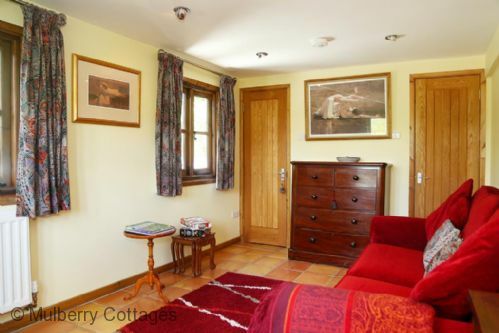 Cosy retreat with pretty cottage garden near charming Wye. 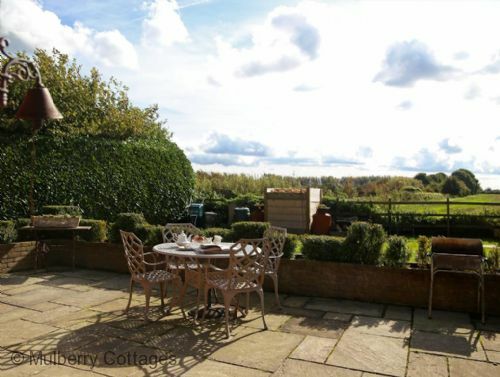 Panoramic views across open Kent countryside. 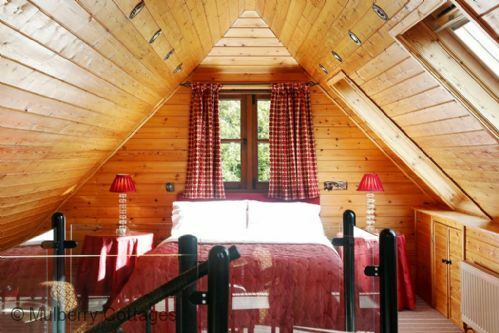 Redfern Barn: sleeps 2+2. 1 master bedroom, 1 double sofa bed, 1 fold-away single bed (which is available for a 3rd child on request), reception room, kitchen/dining room, patio area, space for parking. Master bedroom (sleeps 2) with double bed. A further pull-out single chair bed is available on request. 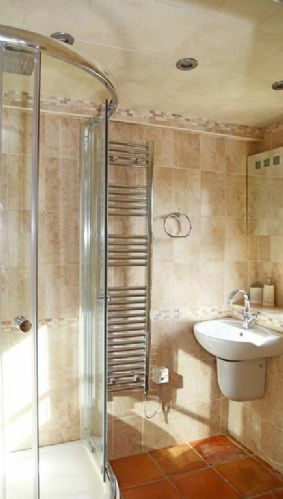 Situated on the outskirts of the pretty rural Kent village of Bilting which is a short drive away from the Medieval City of Canterbury. With wonderful historic buildings to visit during your stay in Kent, Canterbury offers so much for the tourist with theatres, a new shopping centre and of course the Cathedral to mention just a few. Why not walk into the nearby villages of Chilham and Wye with a selection of traditional village shops, pubs and restaurants. Catch a glimpse of the wonderful sight of the vintage Pullman carriage on route to the City of Canterbury. Thanks very much for your hospitality and the welcome pac. We have enjoyed our stay and the beds were lovely and comfortable. We love Redfern Barn and hope to come again. 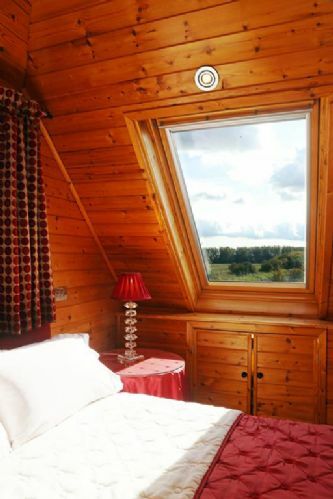 Redfern Barn is such a beautiful place to stay, it's warm, cosy and the views are stunning. The weekend has been wonderful and whilst we were not here for long we know we will miss waking up to the relaxing sound of birds chirping away and the breath of fresh air. Thank you so very much for the lovely stay! It is an amazing little cottage! Also thank you for the eggs, butter, milk and cherries (they were so lovely). Redfern Barn is in the best locations as there are lots of great places to go that are close. We had a wonderful time in the Redfern Barn. Very relaxing environment, and the kids really enjoyed meeting the donkeys. The Barn was ready to live in, so tidy and clean with nice facilities. Thank you. We are definitely going to return after an amazing weekend. Thank you for leaving us things such as milk, eggs and bread. It made the stay that much nicer. Once again, we will 100% return to Redfern! Thank you so much! Thank you for the lovely, welcoming Barn. On pulling up we saw the Christmas tree - lovely. 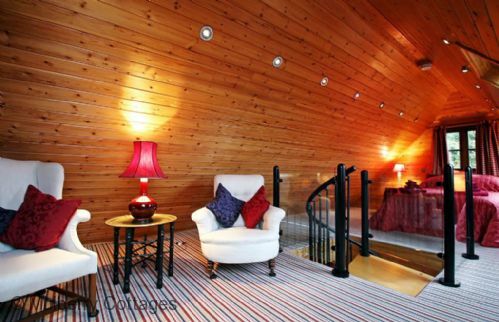 The Barn was a delightful place to have a romantic break away. The facilities were top notch and the welcome pack was wonderful, such a nice touch. It's so easy to explore local places: Wye, Ashford and Canterbury. The donkeys are so friendly. The fireworks on New Year's Eve were a lovely surprise, as was gazing at the stars from bed! Thank you once again. Thank you, Sue, for an amazing stay, the barn is a real treasure - not least for how well kitted out it is. We had a great time in the area and a comfortable stay at Redfern Barn - with a special mention to the sound insulation as we didn't even notice the nearby railway! Thank you for a lovely weekend! Dear Sue, Many thanks for your kind hospitality and the lovely and immaculate Redfern Barn. The house is a perfect place to relax and to explore from. We had a really wonderful few days and we hope to be back. The walk to Wye was lovely and easy. It also allowed us to easily catch the train to Canterbury and enjoy dinner at the Flying Horse before returning "home". The outside space is excellent and beautiful as we were lucky to have some excellent weather! Many thanks, again. I'm sure we'll be back, and we will certainly recommend to friends and family! Thank you very much for your hospitality in the lovely Redfern Barn. We've had both a relaxing and a thrilling week! Relaxing while walking along the Stour River, or to the "devil's kneeling through", or in the footsteps of Jane Austen. Thrilling hours were spent in Canterbury, Rochester and in the many, many churches all around Kent. We love this country and we surely wish to return soon. Dear Sue, thank you for your kind words each day, and for the many delicious and attentive gifts we received, such as eggs, bread, beans and potatoes. Indeed, we had a lovely stay here, thank you very much. Thank you for such lovely accommodation – we would love to stay longer! Fantastic Holiday, lovely setting, beautiful barn! We enjoyed our holiday in this lovely cottage, we had a wonderful time. Lovey cottage with everything in it that we needed and a great location for walking. We had a lovely week, it is our second time here. Very friendly and ho3emly touch leaving us the food essentials to start us off – the week wasn’t long enough! If Kent is the Garden of England, this is the Garden of Holiday Homes. It is one of the most beautiful places we have ever stayed. We spent a wonderful week at Redfern Barn and had lots of fun – thank you for your warm hospitality we do not want to go home! We had another lovely stay here, it feels like we are coming home when we come to Redfern Barn! It was perfect. We will definitely go and stay there again. 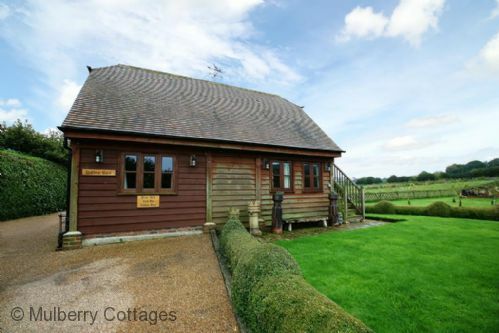 Please note as this property is located in the heart of the countryside the Wi-Fi can be intermittent. Can sleep a maximum of 3 adults, or 2 adults and 2 children (another single sofa bed is available for a 3rd child on request). welcome pack provided including bread, local cheese, eggs, milk, butter, biscuits, seasonal fruit and fresh flowers. Please note the property is located close to a railway line but previous guests have not found this to be an issue.